Submitted by Shadooow on 2015-01-21 05:19. Mostly tilefade issues like the tree foliage on bridge etc. 2) Changed the "chasm" texture. 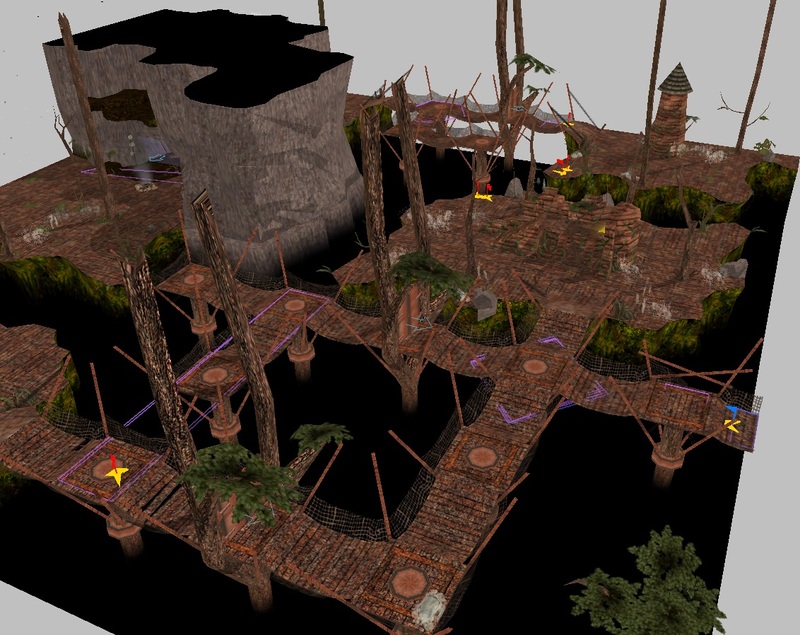 Original chasm used same texture as for ground, this probably made sense as the platforms were supposed to be a big tree trunk however it looked ugly especially under rocky cliffs. Newly, the "chasm" texture under cliffs will be the original vanilla forest one and "chasm" under platforms will be a green flora style. 3) Many textures restored to Bioware original. Many of them weren't changed at all only renamed to ttf02. Since original author was using low resolution ones the result was quite ugly especially on webs. So I changed all of these into their TTF01 counterparts which overally improves quality of this tileset. Not sure about the rest texures, they appear slightly darkened or something so I kept them (which means they appear low res - floor, walls, bridge...). 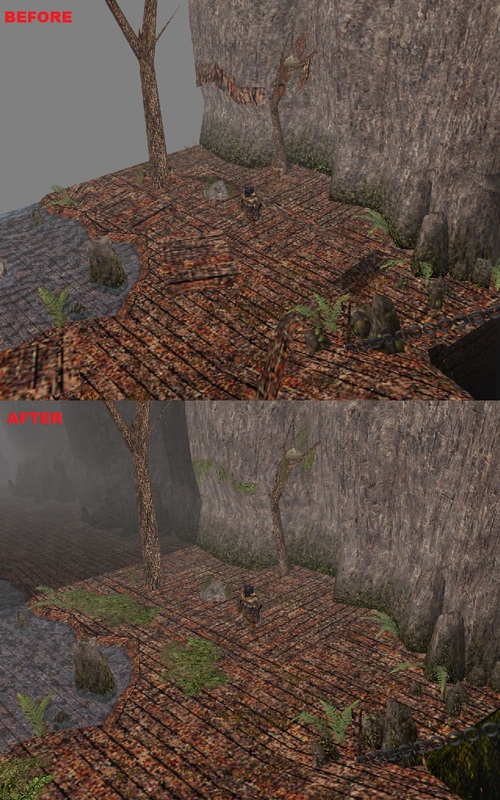 4) Removed the "grassrim" objects. This is in default forest a grass that is used on pit borders and around trees etc., however this texture was changed in this tileset to be the same as ground which however end up looking horrible especially because that texture was extremely low resolution so it looked completelly blurry. Tried to put vanilla grassy "grassrim" texture but didn't like the result so I simply removed all objects with this texture (technically not removed but alpha set to 0). Turned out these objects are not needed at all in this tileset. 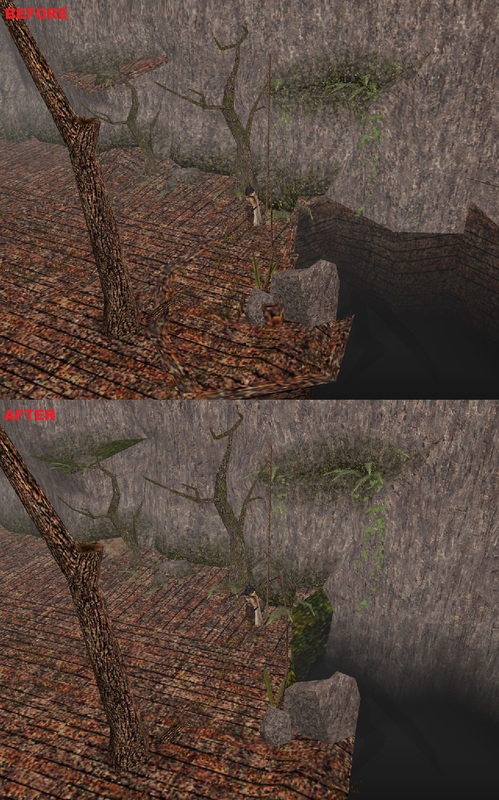 5) Fixed "grass" texture in high cliff overhangs. Since "grass" is a plank in this tileset this looked really horrible. Changed to vanilla forest grass texture. 6) Added missing edge tiles. It doesn't often look very good but its still better than void that used to be there. 7) Added a "high-forest" terrain from 'Foret des ombres' tileset. This is a tree foliage filler into pit. Its placement is very limited as it needs free pit square, but maybe I will improve this in future and allow use it around bridge terrain too. 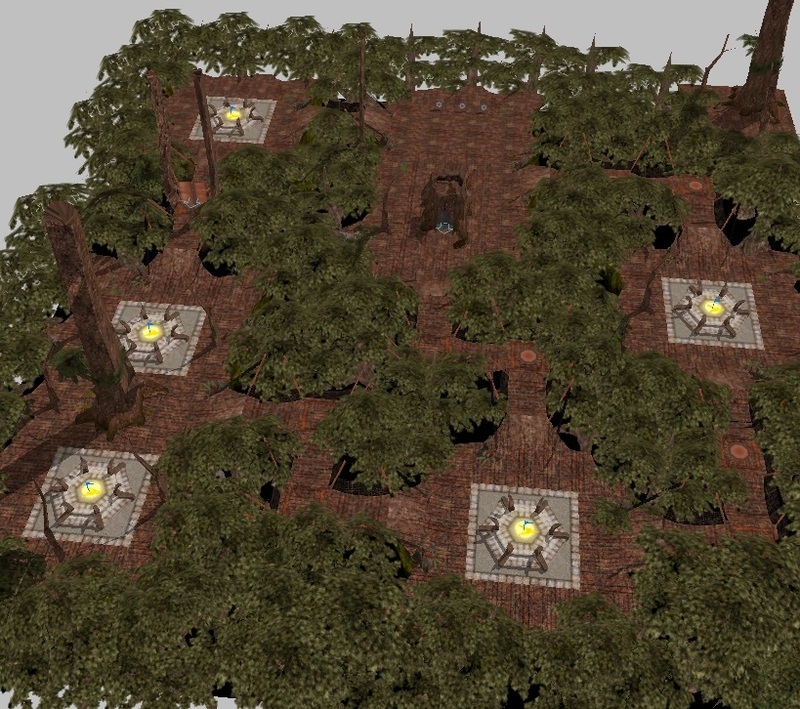 8) Renamed from "Neverwinter Wood" to "Tree City". Removed door models (wasn't ever needed), removed now unused textures.